I came to know Liz Van Hooser when she was the food writer for The Florida Times-Union and I was the society editor, arts and travel writer. She now lives in Missouri and blogs for Community Kitchen. This is a recipe she promised her Florida friends after she first made it. Here's her blog and the recipe. Rum-infused whipped cream puts this dessert over the top. Those dark shavings on the cream are vanilla bean seeds, which smell and taste divine. Ever since I met my fiancé, Joe, I’ve been hearing about his coveted, secret blackberry patches. This past summer, enduring the yin to winter’s yang in the form of oppressive heat and humidity, Joe went berry picking on four occasions, with each trip yielding a large bucket of berries. Last summer, we had them in a cobbler, on cheesecake and over vanilla ice cream. Joe’s mom made a batch of blackberry jelly, the spoils of which we’re still enjoying. But there are only so many of them you can eat, and a half-dozen quart bags were pushed into the nether regions of our freezer. With visions of blue skies and warmer days, last week I decided to make a berry tart. In my quest to acquire more kitchen accessories than I can fit in my kitchen, I have a rarely used tart pan. If you don’t have one, though, the recipe below will work just fine in a deep-dish pie pan. In this recipe, you cook the crust completely before adding the filling. The berry mixture is a simple blend of berries, sugar, lemon juice, lemon zest and cornstarch. 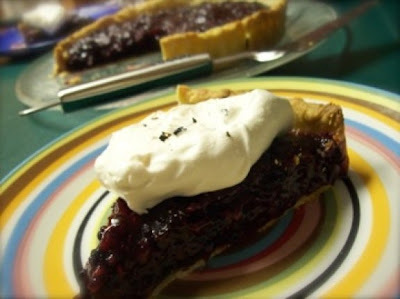 Although the tart would be fine at this point, the dish becomes a truly memorable dessert when topped with rum-infused whipped cream. If you’re dreaming of spring picnics and summer barbeques like me, I recommend this simple dessert. You can use any mix of berries, and I’m willing to bet your sweetheart would like it, too. Enjoy! In a large bowl, using a large wooden spoon, stir together the butter, cream cheese sugar, lemon zest and orange zest until smooth and blended, about two minutes. Add the flour and continue stirring until a soft dough forms. Transfer dough to a work surface, and shape into a thick disk. Wrap disk in plastic wrap, and place in refrigerator (or outside) for 45 minutes or until dough is cool and firm. Lightly dust a work surface, and roll out dough until you have a slightly bigger circle than your baking pan. Turn dough often, and apply flour to prevent sticking. Carefully roll dough around rolling pin and unfurl over pan. Lift edges and ease dough in so it touches the bottom of the center first, then smoosh into the rest of your pan. Fold overhanging dough back over itself, and press into sides of pan. Place crust in freezer (or outside) for about 30 minutes, or until frozen. At this time, preheat oven to 400 degrees. Line frozen dough with foil, and fill with dry beans. Bake 15 minutes. Remove foil and beans, and finish baking the crust until golden brown, about 10 minutes. Allow crust to cool completely before adding berries. In a large stockpot, combine all ingredients and bring to a boil. Mixture will thicken. If too thin, add more cornstarch. Remove pot from burner, and allow filling to rest until warm. Spoon mixture into crust. With an electric mixer (or a very strong hand), mix cream and sugar and cream vigorously, until soft peaks form. On low, add in rum and mix until incorporated. — Adapted from “Williams-Sonoma’s Essentials of Baking” and “The Complete Book of Pies” by Julie Hasson. Thanks, Liz. I owe you one.